With a bold, modern new look, a host of new features and the same drive to highlight the best that the creative advertising industry has to offer, shots.net is bigger and better than ever. At the very real risk of stating the obvious, you’ll have noticed that shots looks different. You could call it a relaunch but we like to think of it more as a rebirth, and let us be the first to welcome you to the all-new shots.net. We’ve been hankering for a makeover for some time now and with this new platform we’ve opted for the full spa treatment, with a Vichy shower, full body polish and a rejuvenating facial. Of course, underneath all that, we remain the same; still dedicated to showcasing the best creative advertising that the world has to offer, still highlighting the companies and people behind that great work, and still featuring insight and thought-leadership from the most respected and innovative people in the business. The most integral of these changes is that the editorial content on this platform is now free-to-view. Since being purchased by Extreme Reach last summer and paired with our sister brands, Source Creative and Slate (on which shots.net is now built), we have been working on a number of changes to make the shots experience a much improved one. The most integral of these changes is that the editorial content on this platform is now free-to-view, which means you can access and share all the great interviews, insight and information across shots.net. With this new platform we’ve opted for the full spa treatment, with a Vichy shower, full body polish and a rejuvenating facial. To truly experience the full benefit of shots, the best approach is to combine it with your Source Creative account. With one simple login, you’ll find every article, spot and news item seamlessly linked with Source’s incredible database. 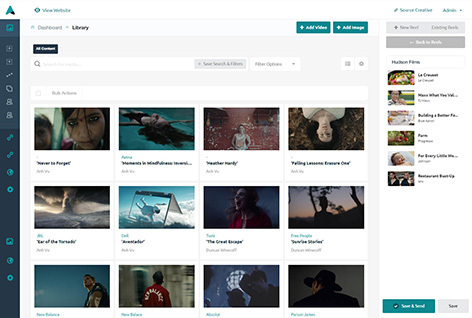 That means one click to directly access people, company and brand details, full credit listings and spot pages that allow you to download the film and generate high-res stills from every second of footage. Coupled with the innovative mood-reel builder, extensive list functionality and personalised notes and reminders that are offered to all Source members, the new package forms a one-stop-shop for inspiration, information and insight. We’ll introduce a new special focus each month which, alongside all the usual fresh work, regular features and news, will examine a specific theme or area of the industry. If you’re an existing shots client, you’ll have received an email to let you know how to activate your account. If you’re an existing Source client, you can just log-in as normal to access the enhanced features. If you’re neither, well, what are you waiting for? You’ll notice that we’ve changed the main navigation on the platform to make your interaction with shots clearer and from today we’ll be introducing a new special focus each month which, alongside all the usual fresh work, regular features and news, will examine a specific theme or area of the industry. We begin with a spotlight on comedy, and over the course of March we’ll be publishing interviews with some of the leading comedy directors and creatives, insight into the state of humour in the advertising arena, and tips on how to harness hilarity. We’ve started our comedic incursion with an interview with one of comedy’s most successful proponents, Sharon Horgan. Over the course of March we’ll be publishing interviews with some of the leading comedy directors and creatives. We begin tomorrow with an interview with one of comedy’s most successful proponents, Sharon Horgan. We hope you enjoy exploring the new shots.net and we welcome feedback to help us hone and enhance the platform in the weeks and months to come. "Danny Edwards & Jamie Madge"